This may come as a surprise to you, but most road accidents are caused by unsafe tyres. Considering that tyres are the most important component of any vehicle, many owners tend to overlook their maintenance and upkeep. According to new research, 10,766 Britons were handed endorsements for being caught with defective tyres fitted to their car in 2016. That’s a lot of people neglecting a simple maintenance check! 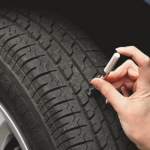 Essentially, regular tyre checks are just as important as making sure your vehicle has gas in the tank, so it’s best to ensure that you keep a good eye on them for any issues. So how can you tell whether it’s still okay to drive with your old tyres? – Your tyres are not correctly balanced. – Your wheels are misaligned. – The issue might be on your tyre pressure. Steering Problems: Nothing is more annoying than fighting with your steering wheel. Unfortunately, misaligned wheels not only cause your tyres to wear off sooner but also make steering and handling quite difficult. The more obvious problem is your vehicle won’t go and brake in a straight line. Also, this may cause some negative effects to your vehicle’s suspension components. Therefore, if you think your wheels have an alignment issue, go to a trusted mechanic as soon as possible. A laser alignment machine will provide a more accurate reading and confirm whether your wheels are misaligned. Cracks, blisters on the sidewall and bulges on the tyre: If there are visible cracks, blisters or cuts on your tyres, this could be a sign that your tyre is developing a leak. This should prompt you to go to your nearest tyre centre and talk about having your tyres replaced. It’s better to be safe than sorry! Driving through large potholes, over a curb or driving with low tyre pressure can cause bulges on your tyres. Continuing to drive on a tyre that has a sidewall bulge is dangerous, as the chances for a blowout are high. Think of it like this, you don’t continue to walk on your ankle after you’ve twisted it. Any tyre with sidewall bulges should be replaced immediately, regardless of the tread condition. Flushed tread depth indicator: When this indicator is flushed along with the rest of the tread, it’s time to replace your tyres. The tread on your tyres should never fall below 1.6 mm in depth and in all honesty, if you regularly drive on slick, wet surfaces, you’d be even better off with twice that much. You can buy a gauge to measure the tread depth the way professionals do. Even if the tyre isn’t the cause of the vibration, the vibration in itself could damage your tyres. If your car is having a bad case of the shakes, regardless of the fact that you’re driving on perfectly paved roads, then it’s best if you get your vehicle booked in to have the vibration investigated. 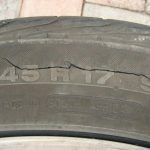 What are the consequences of not maintaining your tyres? Ignoring these signs will pose as a danger to you and others on the road. Not only that but if you are caught with faulty tyres, a driver can be forced to pay a fine of £2,500 for each balding tyre – amounting to £10,000 for four. Listed as a ‘CU30’ offence, being caught with defective tyres is an automatic three-points on your license. It would be best to regularly maintain your tyres so that you can keep that wallet in the pocket and leave collecting points to loyalty cards! Look at it like this, keeping your car healthy and happy will ensure you remain safe! Also, you need to keep in mind that your safety and others rely on all the components of your vehicle working effectively, and since your tyres are the only interface between your car and the road, you need to ensure they are in good shape. Proper care and maintenance will definitely extend the performance and life of your tyres, but most importantly, improve motoring safety. If you think that your tyres are showing any of these signs, get in touch today to find out how Sinspeed can help diagnose and rectify the faults quickly & efficiently. Tags : misaligned tyres, misaligned wheels, tyre safety, tyre tread indicator, tyre wear and tear.